Staff within York’s KMb Unit are not the only people talking about KMb at York. Based on our recent experience, there are many faculty and students who are engaged in KMb activity. Les employés de l’unité de Mobilisation des Connaissances (MdC) de York ne sont pas les seuls à parler de MdC à York. À la lumière de nos récentes expériences, beaucoup de professeurs et d’étudiants sont engagés dans des activités de MdC. One of the early strategic objectives for our work at York University in Knowledge Mobilization (KMb) was to help build a research culture; this was one of the university’s priority areas. And while priorities may change, no one will argue this does not remain important. However, what about building a culture of knowledge mobilization? While I allow you a moment to reflect on that suggestion, I would like to share with you a brief summary from four distinct events which took place March 19 and 20, 2012. 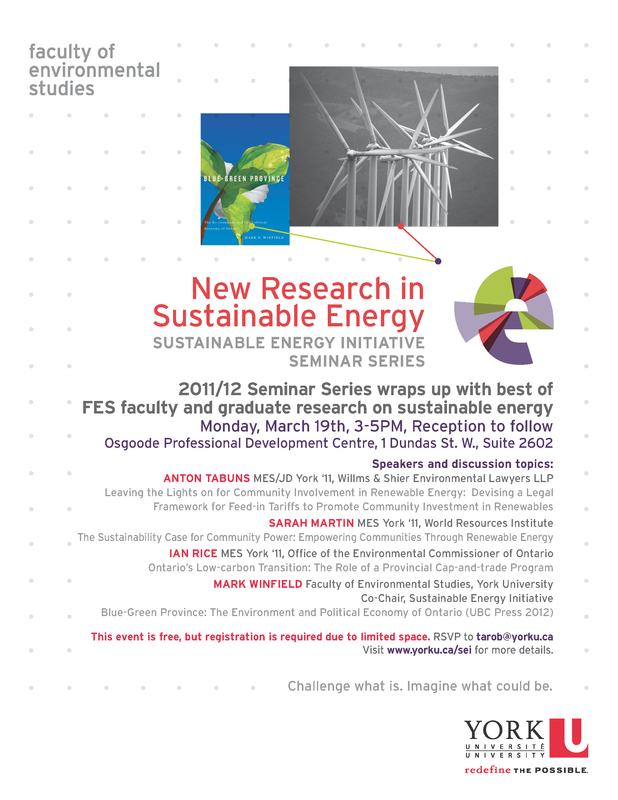 Sustainability Energy Initiative – Monday, March 19, 2012 – Seminar Series – New Research in Sustainable Energy – The Faculty of Environmental Studies, Sustainable Energy Initiative has been established to build and strengthen the teaching, research and partnerships needed to create new green energy economies in Canada and around the world. The connection to KMb was made explicit by Prof. Jose Etcheverry in his introductory comments, stating SEI is “trying to mobilize knowledge, taking a quantum lead toward sustainable energy”. The approximate 50 people present represented research, community and advocacy interests and had probing questions for Prof. Mark Winfield and the three recent MES graduates who spoke on their research in areas of sustainable energy. Prof. Etcheverry, in his role as facilitator, did a masterful job in seeking connections from research to areas of public policy and professional practice. York School of Social Work – Tuesday, March 20, 2012 – World Social Work Day – York faculty within the School of Social Work participated in an international conversation around social work engagement which was facilitated by a Stanford Social Innovation Review webinar. Faculty and students within the School of Social Work have a logical and extensive engagement piece associated to their scholarship, and the web cast, “Channeling Change – Making Collective Impact Work” provided some interesting conversation points for the approximate 20 people including community members of the TD Centre for Community Engagement who assembled in the Kinsmen Building to participate. York’s David Phipps led a conversation for the faculty, graduate students and community leaders who were present. Knowledge Mobilization practices and processes were central to the conversation, and it was a provocative question to pass to the group, “Does York need to break silos and speak on issues with one voice around engaged scholarship?”. Faculty of Education – Tuesday, March 20, 2012 – Research Support Series – Three York faculty spoke to a small but engaged group about Knowledge Co-creation and Knowledge Mobilization. Profs. Jennifer Hyndman, Rick Bello and Steve Gaetz spoke about their experiences with engaged scholarship. Having faculty share their experiences around this is significant given the commitment the university had made in this area as evident by the recent Provostial White Paper “Towards a more engaged university”. United Way York Region – Tuesday, March 20, 2012 – Meeting House – Part of an ongoing series of community engagement around issues relating to social infrastructure in York Region, United Way York Region (and partner in the delivery of KMb) hosted a meeting for residents in Vaughan. These meetings (there are two more planned in Markham and Richmond Hill, and two had already taken place in East Gwillimbury and Newmarket) are helping inform a regional summit on social infrastructure in Fall 2012, and York Research and KMb plan to participate. Such consultation and capacity building is an important first step to engage in KMb. This two day window of time reflects the extent to which KMb has become a significant part of research culture. It is worth noting that this reflects three faculties at York seeking to engage the broader York community around issues of KMb. The KMb Unit has never, nor will it ever, hold proprietary ownership over processes of KMb and we are pleased that we were only audience members contributing to and celebrating KMb success without having to own it. 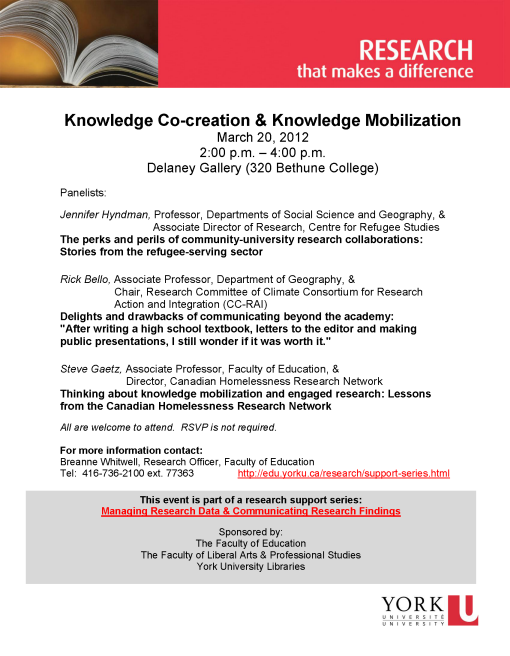 In these three York events, similar to the event hosted by our community partner, we serve as a resource to support and help amplify the work in KMb which is ongoing throughout the university. A culture of KMb? Safe to say we’re well on our way to achieving this! Stay tuned as we develop a regular series profiling engaged scholarship and KMb at York University. Pingback: Outreach to Promote Knowledge Mobilization / La sensibilisation afin de promouvoir la mobilisation des connaissances « Mobilize This!